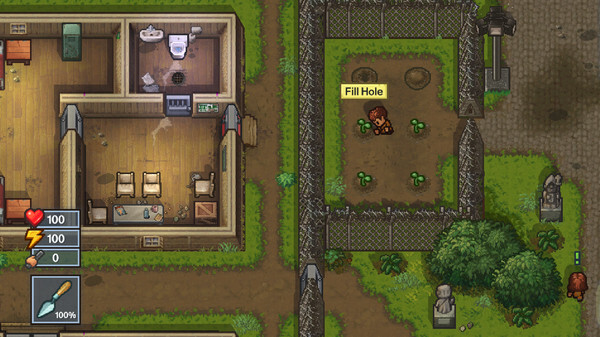 The Escapists 2 was just updated with the 'Inmate Induction' update and it finally allows you to have manual saves, fixing a major gripe I had about it. Honestly, the auto-save only feature was my single biggest annoyance with the game, as it practically forced you to play it safe unless you wanted to lose a lot of progress. I'm extremely happy they've listened to the community, because manual saving gives you much more flexibility in how you play it and allows you to experiment (actually making it fun!). To help you along the way, there's now a few signposts left from inmates to help you pick escape locations. A new NPC named Robinson can also be found in Center Perks 2.0 that will give you some quests, these special quests will help you learn some escape mechanics. Actually pulling off an escape is now a little easier too, as they've adjusted the spawn rates for various items required in crafting. That was another gripe I had, so now they will spawn a little faster and spawn in multiple locations. The Escapists 2 also had another problem, the grinding for keys to unlock other levels. That's also been nailed to a Frisbee and thrown out the window. Instead, you now only need to do three unique escapes to access all prisons. Not only does this remove a lot of grind from the game, it again rewards some experimentation—exactly how it should be. It's a much better game with these changes. It's as if they only just discovered my original article talking about the release and made all the changes I wanted. As a reminder, you can pick it up cheaply in the current Humble Monthly which ends really soon. Otherwise, it's on Steam. Judging by all those gripes , kinda glad i did not pick it up yet.